The Mister and I have had a backyard garden every year we've been together (except for a few logistically difficult years like the one when we were planning our wedding). Last year we finally built a raised garden bed and I've got to say it totally changed the way I looked at gardening. It also increased the number of projects surrounding gardening I felt I could take on. In the past our plot was 4 times the size of the current raised bed. The constant weeding alone was too much to handle. And frankly there were whole sections of the garden that never materialized crops- the plants grew (the weeds grew too) but we never really got a harvest from them. I think there were two issues- it was too big a space for us to realistically manage with our schedule and the soil (despite adding compost) just wasn't right. Last year's garden was fantastic in comparison. We had almost no weeds. It took a fraction of the time to water and care for. And sure, we didn't get any of the zucchini or green peppers we planted- but not because they failed to grow. They were being swiped by something just before fully ready to pick. But it didn't really matter because we had a mountain of those from our farm share anyway. This year I'm so excited about the prospect of the garden that I've ventured into territory I gave up many years ago and have started a few of our own seeds. Last time I tried this it was a miserable failure. The ones sown outside never grew. Out of the ones started inside a few did ok but never really took off even though I hardened them off before moving them into the garden. It all just felt like one more expenditure of energy surrounding the garden that I just couldn't take. Now though I have a different outlook on the whole thing. The garden bed was prepped and ready in under an hour (including planting a few rows of seeds). That's a new record! 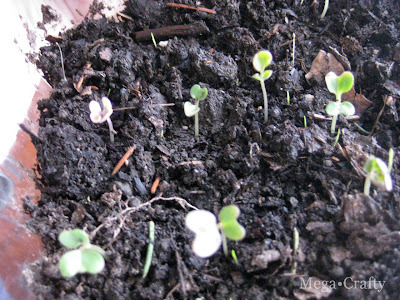 I also started some seedlings inside that started sprouting a couple days ago! 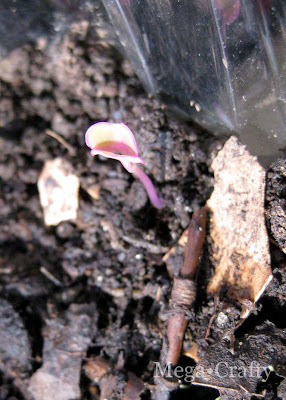 I got a great tip from a blog I love Backyard Farming about planting your seedlings in those clamshell containers that foods are packaged in- they make mini greenhouses, and work like a charm! Check out that post here if you're interested. For now we've only planted cool season crops. And only things we'd like to supplement our farm share with (Spinach, Broccoli, Cauliflower) because we didn't get enough of them last year. 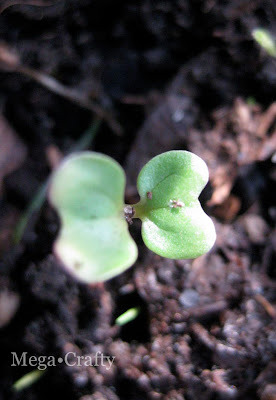 I hope the seedlings continue doing well. If they don't survive I'll be sad but it won't be so bad because I know the gardening season as a whole will be a lot more manageable. Maybe someday we'll have the kind of schedules to incorporate bigger gardens and more backyard food production but for now I'm very happy having downsized to something that's enjoyable and fits with our lifestyle at the moment. Are you getting ready for gardening season? If so I'd love to hear about what you've planted or are going to plant. YES! We definitely are getting ready for garden season! We have followed the great advice I found on Life on the Balcony and I am thrilled to report that we have a virtual forest of sprouts! Usually trying to start seeds around this household has met with failure. A friend sent us 8 different varieties of tomato seeds saved from her garden - which happens to be in Phoenix! We shall see how it goes in the PNW! Wow Pam- it sounds like you might end up with a Mt. of tomato! 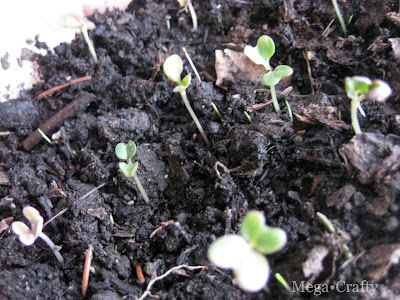 I'm glad to hear your seedlings are doing well- maybe this is just the year for seedlings! Too bad about your hot peppers! I once planted them in the garden. The first harvest was very mild- we ate them like sweet peppers. Second harvest I popped one in my mouth and almost died it was so hot. That's when I learned about cross pollination. Sweet peppers and hot peppers that grow at the same time near each other will cross and the sweet ones will make the hot ones mild. I always want to plant pumpkins! But my yard isn't really suited for them. I've only ended up with pumpkins once in all the years I've planted them. It's amazing what you can grow in containers. despite having the garden plot I sometimes put peas and green beans into containers and have always had wonderful luck. Seed starting is one of my most favorite activities I do all year. I LOVE it.